September 15, 2015 | by The Law Offices of Evan M. Rosen, P.A. Had another trial win recently – thankfully, we have been on a roll, winning multiple trials back to back to back! In this particular case, the original lender and the Plaintiff are Flagstar. Attached to the Complaint is an unendorsed note, payable to Flagstar. As is common in foreclosure cases, the Plaintiff substitutes in Green Tree a few months back and shows up at trial with note, endorsed, in blank. I object to note as being outside the scope of the pleadings, citing to Holub v. Holub – parties are bound by their pleadings, and 1.130 – attachments to pleadings are considered a part of the pleading for all purposes. Judge listens and goes back and forth but lets the note into evidence, with a smile to me. I think she’s hinting she knows this might later be a problem if the Plaintiff doesn’t move to amend their complaint and, more importantly, it could be a standing at inception issue. After direct examination of the bank’s witness, Christopher Ly, a rigorous cross examination ensues resulting from him trying to be cute and not answer my questions. I keep hammering him and the Judge never stops me. Eventually, he capitulates and gives in, just in time for my cross on no evidence to show possession at inception, condition of note at inception and when the endorsements were placed on the note. He wasn’t there when the note was endorsed, he didn’t see the endorsement placed on the note, he didn’t place the indorsement on the note, he didn’t possess the note at anytime, etc., and more…. that was fun. After much argument, the Judge agrees the Plaintiff has not met their burden. She agrees pleadings are not evidence, period, and will not make a “leap of faith,” as per Deutsche Bank v. Huber. (“However, this court does not make “logical and equitable” leaps of faith, as it cannot (and should not) make any such determination unsupported by the record before it.“) Beautiful! The Plaintiff never proved who had possession at inception. The only thing we know is there is now a note endorsed in blank and no one knows where the note was at any time prior to today. August 3, 2015 | by The Law Offices of Evan M. Rosen, P.A. We had a great win just before trial started recently. This was a very special case, referred by a friend. The client had a lot going on in her life, including a foreclosure judgment and the pending sale of her home. She was successful in getting the sale reset three times but there was likely no judge in the world that would have reset it a fourth time. The first thing we had to do was get that judgment vacated! Based on a unique factual scenario, we found an angle and moved to vacate the judgment on the 363rd day after it was entered. We were really threading the needle on this but ultimately, we were on solid legal ground. The judge agreed with us and we were successful in unwinding the clock. The judgment was vacated and the sale was cancelled. We next amended our answer, fired off some discovery and then before long, the case got set for trial. July 22, 2015 | by The Law Offices of Evan M. Rosen, P.A.
. . . to establish standing in this case is a simple matter. The Plaintiff in this case — the original Plaintiff was OneWest Bank. And OneWest Bank, upon filing the complaint, had a copy of the note attached to the complaint. This was promptly followed, Your Honor, with filing that same — the original note for that complaint. 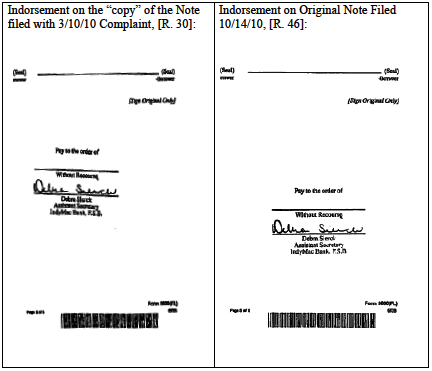 The endorsements that were in the copy that was filed with the [Complaint] are the same endorsements that were in the original that was filed with [t]he Court. (emphasis added). May 18, 2015 | by The Law Offices of Evan M. Rosen, P.A. At this point, I offer to the Plaintiff’s attorney, quietly, to take a Voluntary Dismissal and I’ll gladly agree it can be w/o prejudice, as this might help on some statute of limitations issues. She emphatically says no. Judge Has Enough, Tells Bank Lawyer She is Referring Him to The Bar in Our Latest Trial Win! February 23, 2015 | by The Law Offices of Evan M. Rosen, P.A. Without me saying a word, the Judge denies their motion. We wait around to be called up for trial. During which time, I watch the Judge, with a little unsolicited input from the “peanut gallery” (me), refuse to apply a recent Calloway case – a case which turns the evidence code on its ear. I informed the Defendant’s counsel during his argument that motions for rehearing and for certification were filed, therefore, the Calloway case is not final law. I hated to do it but the Judge was very seriously considering Calloway and I wanted to do all I could to prevent the well from being tainted! So, I was talking out loud a few times but ultimately whispered to Defendant’s counsel a few times and passed him some notes. The Judge asked Defendant’s counsel how he knew and he said a “little birdie told me.” The Judge looked right at me so I offered to show her the motions on my ipad but she said it’s was okay. Then she said, even if it the law was final, “the 4th is now legislating from the bench” and are trying to change the evidence code! Calloway conflicts with the 3rd. She asks what the case from the 3rd on this. I yell out Holt v Grimes. She says, right. So, there is a conflict with the 3rd and I’m bound to follow the 3rd. She excludes the payment history. Plaintiff’s lawyer asks for continuance. Judge denies and then the bank takes a voluntary dismissal. Beautiful. January 6, 2015 | by The Law Offices of Evan M. Rosen, P.A. December 13, 2014 | by The Law Offices of Evan M. Rosen, P.A. November 26, 2014 | by The Law Offices of Evan M. Rosen, P.A. The deposition of Lona Hunt took place on October 17, 2014, during which time Ms. Hunt was questioned about her knowledge of the truth and accuracy of the facts in the foreclosure complaint, which she allegedly verified. During the deposition, Ms. Hunt admitted twice that she did not read the complaint, even though she swore, in the complaint, under penalty of perjury, that she had. Further, with her limited knowledge, it was impossible for her to truthfully and accurately verify all the facts alleged in the complaint. Our blog post on this with more detail is here. After the deposition, we quickly prepared, filed and set down for hearing a Motion to Strike Verification of the Complaint as a Sham. The hearing was set for next week and we were looking forward to seeing the look on the judge’s face when she heard about the blatant perjury in this case. However, late yesterday, the Plaintiff filed and served the below Notice of Voluntary Dismissal. This means, CASE DISMISSED! While we would have preferred to see some more drastic impact from this deposition, causing ripples of concern among the servicing industry, leading them to change their perjerous practices, we know that is wishful, if not delusional, thinking. Some members of our team have devoted years of their lives to seeing change enacted and were instrumental in exposing robo-signing and other illegal activities since the very beginning of the crisis. Based on those experiences, we’ve known for years that changing the banking industry’s practices, which have been whitewashed and enabled by the powers that be, would be extremely unlikely. Change may come at some point but it’s apparently not coming from exposing the endless criminal activities of the banking class. What we can do, however, is win cases and best serve our clients, one case, deposition, argument, motion, hearing and trial at a time! We can also see to it that the bank refunds our clients all their attorney’s fees paid to us when we do win, like we have in this case.